My husband and I first attempted skate skiing when we moved to Alaska. Determined to learn on our own, we headed out to the trails and strapped on our skis….only to spend the entire day with frustrating (and often comical) results. A weekend ski clinic did wonders as we were taught the basics by an expert who truly understood all the elements of good technique. 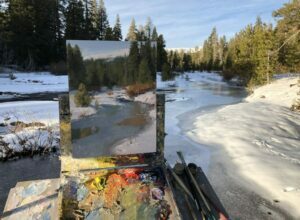 As with skiing, you can save yourself a lot of time and effort in art by finding a good instructor who can walk you through the basics of painting, taking some of the mystery out of the craft. Yes, an artist can be self-taught, but most times the process takes a lot longer and good input from competent professionals will speed you on your way to making your own art without stumbling over technical problems at the beginning. The long Alaskan winters allowed me lots of time to ski. 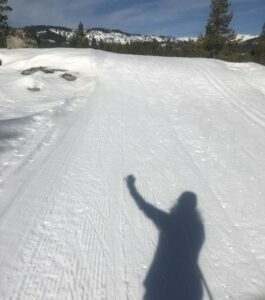 Here in the radically shorter winters of California, I’m skiing a fraction of the amount that I used to. Consequently, I can’t expect to win any races or to see great improvement in my technique. As with skiing, don’t expect to get better at painting if you don’t work at it on a consistent basis. Practice really does make perfect, and getting into the habit of painting nearly every day will help you to see gains more quickly. Every now and then when I’m out plein air painting, a passer-by will comment, “You make it look so easy!” (I always have to resist the impulse to reply, “Well I certainly fooled you, didn’t I?”) As I’ve said many times before, I don’t think painting is easy; I think painting is really hard, but aspects of it have gotten easier over years of repetition and practice. I’ve been guilty of watching elite skiers fly past me and feeling a pang of jealousy at the apparent ease with which they ski, but I know that they’ve put in countless hours of practice to get that good. Let’s face it: no matter how good we get, at some point every skier falls and every painter fails. The old skiing adage, “if you’re not falling down, you’re not learning anything,” applies to painting as well. In order to grow, we have to push ourselves to do things that that are risky and learn from our mistakes. 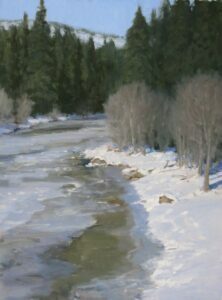 I could just ski the flat trails or paint easy subject matter, but where would that get me? I’d be a mediocre skier and a ho-hum painter. Although there have been many times of frustration when I’ve wanted to unhook my skis and storm off the trails or chuck my painting into the woods and head home, I’ve learned that I have to channel that negative energy into something positive in order to grow. Much like an athlete analyzes videos of his/her performance to look for ways to improve, take those paintings that didn’t hit the mark back to the studio and give them a detailed critique to learn from your errors. Remember that it’s never a failure if you’ve had a brush in your hand and have been painting with full concentration and intent. If you try, you either succeed or you learn. Challenging yourself to the literal hills of skiing and the metaphorical hills of art will force you to conquer new techniques and overcome fears, making you better at your craft overall. We’ve all seen the skier stuck at the top of a hill, frozen with fear of the downslope ahead. Staring at a blank canvas can elicit that same kind of paralysis. The worry of making a mistake can be overwhelming, but you’ve got to start somewhere. Take a deep breath and make that first mark. Remember that errors can always be corrected and that the only thing worse than bringing home a bad painting is not doing a painting at all. But don’t get so overconfident that you’re like that skier who flies down the mountain without a care in the world, only to do an “Agony of Defeat” crash into the snow. Be sure to carefully think out your approach to the painting. Anyone who has ever taken one of my workshops knows that I’m fanatical about thumbnails: they are the roadmap to the painting that makes everything else easier. Just a few minutes of sketches and planning can save you from falling flat on your face. No matter how many times I’ve fallen or how lousy my painting turns out, at the end of a day outside I always take a moment to look around and be grateful for the opportunity to spend some time outdoors. A day in nature is a gift not to be taken for granted. A positive attitude goes a long way in all endeavors, especially painting, so take the time to be thankful for what you have already accomplished and to think of productive and positive ways to improve yourself.